Life is strange for Patrick Fort; being a medical student with Asperger’s Syndrome doesn’t come without its challenges–and that’s before he is faced with solving a possible murder. Because the body Patrick is examining in anatomy class is trying to tell him all kinds of things. And now he must stay out of danger long enough to unravel the mystery–while he dissects his own evidence. This novel is one to avoid if you’re not in the right frame of mind for extended sessions in a coma ward or a dissecting room. 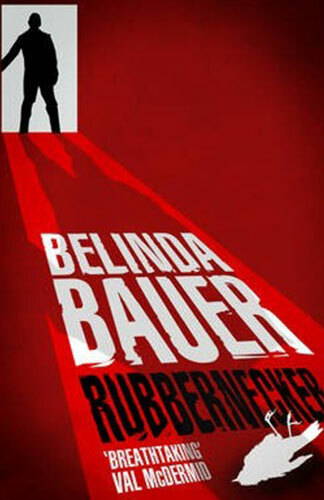 On the other hand, if you don’t mind morbid subjects and black humour, and you’re patient enough to go on an unorthodox sleuthing mission in the company of a young man living with Asperger’s Syndrome, you’re likely to enjoy Belinda Bauer’s Rubbernecker. In a Cardiff neurological ward we enter into the interior monologue of Samuel Galen, bed-bound following a road accident. He is trapped inside his body, able to see, hear and comprehend but unable to communicate. Meantime, slacker nurse Tracy Evans schemes to seduce the rich Mr Deal, a regular visitor whose wife is another patient. One night Galen watches as a figure in scrubs surreptitiously attends to a comatose man in a nearby bed and the man dies. A few months later Galen dies too. His death is attributed to a heart attack precipitated by choking on phlegm. In a small town we meet Patrick Fort, who has had an obsession with examining dead animals since a disturbing experience when, aged eight, he was crossing the street with his father when a hit-run driver struck and killed his father. Patrick wants to know where the deceased go after they pass through that metaphorical one-way door his school counsellor told him about. Aged eighteen, Patrick decides he may be able to solve the existential mystery by examining dead humans, and he gains admission to Cardiff University thanks to its disability quota. Teamed with a group of medical students, he is charged with slowly and painstakingly dissecting the embalmed body of an anonymous man in order to learn about anatomy and diagnose the undisclosed cause of death. When Patrick discovers a peanut in the cadaver’s throat, he suspects murder and sets out on a comical and increasingly risky course of action as he investigates who the victim was and precisely how and why he came to die. Ultimately all the story strands come together, with Patrick finding out not only the identity of the cadaver’s killer but also the identity of the hit-run driver who struck his own father.